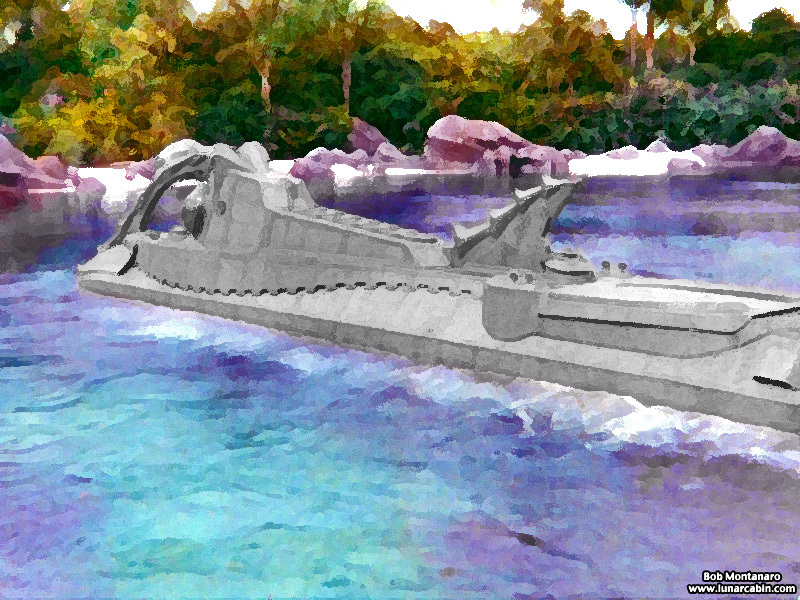 A late 1970s photo (retouched due to the poor quality of the actual image) of one of the Nautilus submarines used in the 20,000 Leagues Under the Sea: Submarine Voyage attraction at Disney World in Orlando. Based on the classic 1954 Disney movie that brought Jules Verne novel to life, the ride was extremely popular during its years of operation (1971-1994). Boarding one of the submarines, the guests would sit below water level where they could glimpse sea life, wrecked ships, the ruins of submerged civilizations and more as the submarine traversed the lagoon and tunnel riding along on a track. Sadly, ongoing maintenance issues and the limited number of guests that could be accommodated on the ride at any one time led to the abrupt closure and demolition of the ride. Yes, was so exciting to go down into this submarine even as a young adult. We lived the adventure, and felt we had experienced being the explorer…didn’t know it was discontinued.